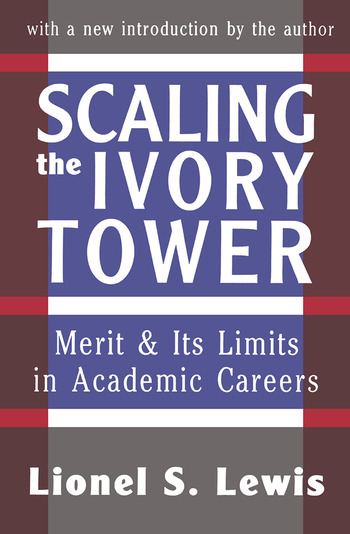 Following in the tradition of Thorstein Veblen's Higher Learning in America, Lionel S. Lewis has amassed solid evidence to support his conclusions about what leads to success in Scaling the Ivory Tower. As background to his consideration of academic freedom, sexism, merit, tenure, and other such highly charged subjects, Lewis examines the attitudes of those in universities toward academic qualification. The modern rule of thumb has become publish or perish. According to Lewis, however, research and publication may not be such prime considerations after all. Two thought-provoking chapters are devoted to an examination of letters of recommendation as important factors in hiring and promoting in the academic world. Lewis also scrutinizes academic freedom cases from the archives of the American Association of University Professors. Other intriguing issues examined by Lewis are: how spouses and significant others factor into whether or not a professor gets a promotion; a typical day in the life, both academic and personal, of a professor; how the celebrity syndrome has spread to campus; discrimination against women; and bureaucracy as a contributing factor to campus unrest. In the new introduction, Lewis affirms that the most apparent changes in higher education since Scaling the Ivory Tower was initially published have actually made the campus less meritocratic, and less a place where quality academic work is recognized and rewarded. One contributing factor is the necessity to consider age, gender, ethnicity, and race in personnel decisions. Because many on campus are convinced that academic life can only be improved when the demographics of faculty reflect those in the larger society, departments are routinely expected to explain why they did not fill an opening with someone from an underrepresented group. While showing some irreverence toward academia, Scaling the Ivory Tower should also provoke sober consideration of where our colleges and universities are headed. This is a significant volume for university administrators, academics, and graduate students.